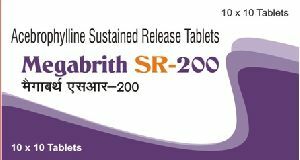 Megabrith sr 200 ensures freedom to breath easily. Reduce the frequencey of episodes of bronchial obstruction. Reduce the need for beta-2 agonistis and improves indexes of ventilatory function. Possesses bothmuco- regulating and bronchodilator effectcts thereby showing earlier improvement in signs & symptoms in comparison with theophylline which has only bronchodilator effects. Indication : Acute or chronic bronchitis. Chronic obstructive or asthma like bronchitis. Recirrence of chronic bronchitis.